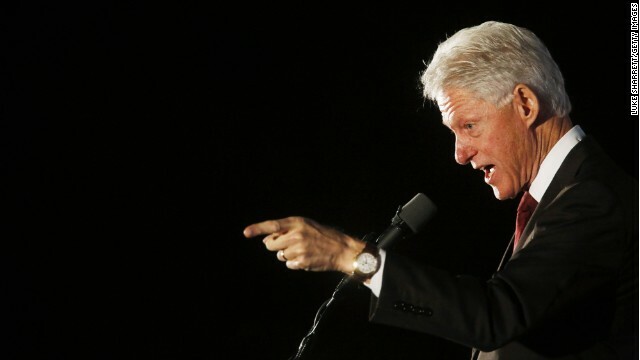 Washington (CNN) - The Democratic Party is showcasing former President Bill Clinton to help launch a new program to expand voters' access to polls. An announcement Thursday by the Democratic National Committee comes as the party committee kicks off its Winter Meeting here in the nation's capital. During three days of meetings, the DNC has its eyes on this year's midterm elections, as the party aims to hold onto its majority in the Senate, attempts the extremely challenging effort to recapture control of the House of Representatives, and tries to make gains in governors' offices. But the party committee also has its sights set on the 2016 presidential campaign, which is just on the horizon, and will begin discussions on such crucial issues as the primary calendar and when the Democrats should hold their nominating convention. "Today, there is no greater assault on our core values than the rampant efforts to restrict the right to vote," says Clinton in a nearly five-minute video that the DNC put up on YouTube Thursday morning. The DNC says it will set up a permanent in-house team, as well put staff in key battleground states, in an effort to increase early voting, online voter reigstration, and fight against voter identification laws which the party decribes as a move by Republicans to lower voter participation. The battle over voting requirements between the two parties has become more fierce over the past couple of years, as a number of states passed stricter voter ID laws. Some of those measures have been overturned in the courts. Republicans who back tougher voter ID laws say they are needed to reduce voter fraud. Democrats argue that the laws are aimed at preventing the type of voters who tend to support Democrats from casting ballots. The former president said such moves are "designed to make it harder for working people, especially people of color, the elderly, those with disabilities, and young college students, to get to the polls. To form that more perfect union we have to expand rights, not take them away." "It's not enough anymore just to be against these new voting restrictions. We need to get back on the road forward and work for more and easier voting," Clinton added. The DNC's pushback against the new voter ID laws and the move to expand voter rights comes as the party faces challenges at the ballot box this November. Democrats hold a 55-45 majority in the Senate (53 Democrats and two independents who caucus with the party), but are defending 21 of the 36 seats up in November's midterm elections. And half of the seats Democrats are defending are located in red or purple states. In the House, Democrats need to pick up 17 GOP-held seats needed to win back control of the Republican-led chamber, a feat political handicappers say is unlikely considering the shrinking number of competitive congressional districts. In the states, Democrats hope to go on offense in the gubernatorial contests, as the GOP's defending 22 of the 36 seats up for grabs this November. Donna Brazile, the DNC's vice chair of voter registration and participation, said that the Winter Meeting provides "an opportunity to focus on this election cycle." "We're going to look at opportunities for Democrats to regain some of the ground lost in 2010. This is a chance for us to showcase our talent, fine tune our message and prepare our troops for an intense battle this fall," added Brazile, a CNN contributor. As part of that push, the DNC is also working to leverage the voter data and election tools refined during Barack Obama's historically tech-savvy presidential campaigns in this year's contests. Earlier this week the party committee said it will make accessible to Democratic campaigns nationwide this year a voter file with constantly updated data from past elections in an effort to coordinate voter information as well as help those campaigns better strategize and manage volunteers. At a meeting with reporters Tuesday at their Capitol Hill headquarters, a DNC official added that they are bringing on an additional dozen digital staffers to bolster the party committee's efforts. The DNC's counterpart, the Republican National Committee, has also invested heavily in technology, trying to close digital divide between the two parties - a key deficiency that hurt the GOP in 2012 - as well as emphasizing a restructuring of their ground game on the community level. An email by the RNC to reporters Thursday morning argued that the DNC is not "investing in a long-term national ground game." The DNC meeting comes a few weeks after the RNC gave near-unanimous approval to a package of rules changes that would condense the 2016 presidential nominating calendar and help the Republican party avoid the kind of protracted party infighting that hurt GOP nominee Mitt Romney's general election appeal in 2012. The changes by the RNC come as the party drives towards moving their nominating convention from late summer to a June window, which would make the next Republican National Convention the earliest convention in either party since 1948. The RNC has announced its support for the June move but will formally vote on the change later. The DNC's Rules and Bylaws Committee on Thursday will begin discussions of the moves the RNC made, but party leaders say no decisions will be made at the Winter Meeting. The committee will meet again in April and early June, and plans to vote on its primary calendar suggestions by early autumn, before the DNC's next major gathering. "We will want to take a close look at some of the things they've (the RNC) done in terms of enforcement, which are more strict than what we've done," said longtime Rules and Bylaws Committee Co-chairman James Roosevelt, who says he's a strong proponent of starting the primary calendar in February. "We think we've come up with a process that's worked pretty well for the goal of getting a full airing of the potential candidates, both those who start as favorites and have significant funding, and those who gain momentum during the process and get better funding as they go along. We've found the past several cycles that our primary calendar's worked pretty well for us," Roosevelt added. The RNC also moved towards stiffening the penalties against states that break the rules and move up their primary or caucus dates, which happened during 2008 and 2012 presidential cycles. Democrats appear to favor that move. "It's imperative that the parties enforce the rules, that states comply with the requirements, that they stay within the windows of the calendar.After the decisions are made, we cannot change the rules to accommodate certain states," Brazile told CNN. As for moving the date of the Democratic convention up to June, as the Republicans are seriously considering, Brazile and Roosevelt seemed skeptical. "We need to keep people motivated and excited. I'm still of mixed opinion of moving it up too soon. Move it up before the Olympics and people may forget about it too soon." "I'm open to arguments for moving up the date of the convention, butI haven't heard anybody on the Democratic side make such arguments," Roosevelt added. Yep and voters are under attack by ACORN, Obamas private political arm and a progressive bunch who lie like rugs... ANYONE who does not have an ID card today is DEAD! And a few of them also have them.... Please the only attack on voting comes from the people and groups who want extended voting days, no over sight and a free for all at the polls so they can run their bus loads through as fast as possible... Clinton lies with the best of them– Remember he was disbarred because of his lies. Jeff Brown...How very thoughtful of you to recognize Chris-E and his efforts! Now perhaps you could comment on Gurgyls posts. Again Thank You! "I'm renting a big van and trolling the local home depot, and loading in a couple dozen illegals, and hit all the local voting booths, we got your back Hillary." Don't bother, she won't need your help to win. By the numbers. There is 2 years between elections. No law says you have to wait to the last minute to Register to Vote! Anybody that wants to Register to Vote will get it done, even if there are a few Obstacles. So your or Slick Willie's lies won't fly. But you knew that didn't you? Ok, I agree that you are not playing with a full deck. It is expected as after all if Slick Willy doesn't have a Full Deck, why should you. Unless I am wrong there is a requirement for a photo ID for use of OBAMACARE. Does that mean he is trying to stop the use of health care? And since it is a law you must have your health care by extension that means it is a law you have to have photo ID. Why would producing your ID cause someone to not vote, unless the ID was from some other country, a death certificate, or on a wanted poster? @Anonymous-In 2000 & 2004 the left was crying voter fraud. Time to come off your denial cloud. Good Lord, Is ACORN even around anymore?? I agree that you are not playing with a full deck. "Louie" Gohmert / Gunderson 2014 ? Clinton is right, voters are under assault—by huge, authoritarian government that robs us of our wealth and industry and saddles us with intolerable burdens. As to "voter's rights," what about a little "voter's responsibility," like refraining from voting for the politician who offer nothing but the economy-ruining measures of promising ever more freebies paid for by others? What are the actual statistics of voter fraud? Isn't it something like less than 2%? If I wanter to commit voter fraud I'd just do a mail-in ballot as that's the easiest way to do it. Women are particularly vulnerable to voter ID laws because of name descrepancies. If you name isn't EXACTLY the same on voter rolls as it is on your driver license/ID, you get a "provisional ballot". The state of Florida revised their requiremets for obtaining a State Driver License/ID a few years ago, and for elderly people it can be a real problem as they're unable to produce the identification required to GET the license/ID. Yeah, except the only people "cryin"" are the repugs.